Be the first to share your favorite memory, photo or story of Joycelyn. This memorial page is dedicated for family, friends and future generations to celebrate the life of their loved one. 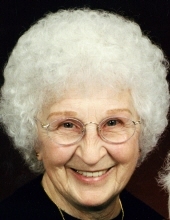 Joycelyn Margaret Jones, 88 of Lodi, Ohio passed away Tuesday, February 5, 2019 at Burbank Parke Care Center following a period of declining health. She was born October 23, 1930 in Rocky River, Ohio to Axel and Mary (Heiden) Hoy. She grew up there and graduated from Rocky River High School in 1949. Joycelyn resided Lodi lived most of her life. She had been employed by the former Latex Industries in Chippewa Lake. Joycelyn was a 3-time cancer survivor. She loved animals and had a number of rescue dogs over the years. She also enjoyed watching TV game shows and the sitcom The Golden Girls. She was preceded in death by her first husband Alvin Gentry, second husband Carl Jones, and brothers Jim and Don Hoy. Visitation will be Monday, February 11, from 11:00 AM to 1:00 PM at Parker Funeral Home, 210 Medina St., Lodi (330-948-1122), where the funeral service will be held immediately following the visitation beginning at 1:00 PM. Rev. Christopher Cahill will officiate. Memorial contributions may be made to either Hospice of Medina County, 5075 Windfall Rd., Medina, OH 44256 or Medina County SPCA, 8790 Guilford Rd., Seville, OH 44273. "Email Address" would like to share the life celebration of Joycelyn M. Jones. Click on the "link" to go to share a favorite memory or leave a condolence message for the family.